It hadn’t happened since the early 1960s … two of the most popular surf bands playing on the same bill. So when The Surfaris and The Ventures came to town and showed up at Don the Beachcomber, the sold out concert made … history again. Both bands had mega hit recordings back in surfing music’s heyday, creating classics that are easily recognized by multiple generations today. With wife Gene on bass guitar, son Deven took over drums for this tune, as Joel belted out the classic lyrics that everyone in the audience seemed to know. It was the song that started it all for the Surfaris back in 1962 when Bob and his friends rented a small studio in Cucamonga. Coincidently, during this time that initial recording session, the group put together another little composition, known as “Wipe Out.” After pressing 100 copies to circulate among friends and present to radio stations, Dot Records got a hold of the song, and signed them. Circulating the single to radio stations and record stores across the country, both “Wipe Out,” and “Surfer Joe” made Billboard’s Top 100 by July of 1963. The hit singles sold millions of copies, establishing them as the one of the most popular surf music bands around. The audience went wild, showing their enthusiasm by singing along. The band finished their set with other notables. A rock ‘n’ roll version of “Route 66,” was followed by father and son working perfect tandem guitar in a rousing “Misirlou,” As if that wasn’t enough to get the crowd on their feet (and it was), they presented their grand finale. They launched into “Wipe Out,” perhaps their most famous song of all. It was played true to form, imprinting forever on the brains of an appreciative audience, some of the best surf sounds to ever grace a stage. The Ventures had their original inception in 1958. 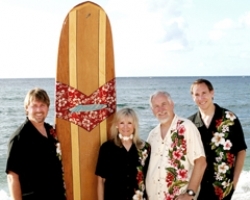 The line up has undergone many changes since then, but members of the band have kept true to the original surf sound they are most famous for. Current band members Bob Spalding and Gerry McGee, both on lead and bass guitars, Don Wilson on rhythm guitar, and Leon Taylor on drums currently make up the group. “Diamond Head” followed this, having been a huge hit for them in 1964. All of the numbers showed an amazing guitar chemistry between Spalding and McGee. Their dueling instruments were highlighted by several selections, most notably “Pipeline,” and “Hawaii Five-O.” The versatility of The Ventures musical range can be heard on two jazz classics they have incorporated into their line up. “Perfidia,” and “Caravan” have been performed by jazz notables since the 1940’s. But there is nothing like a searing electric guitar to bring out the best in both of these classics which is exactly what Spalding and McGee did. They were beautiful renditions of both, but it was “Caravan” that held a very special surprise. Leon Taylor began what seemed like a traditional drum solo, but- lasting upward of 20 minutes- this solo delved into a variety of drum riffs, all different, all amazing. It concluded with a mind bending drumstick riff on the strings of Spaldings guitar, the likes of which no one in the room had ever seen, or heard. Exhausted, the band walked off stage after saying “goodnight” to an adoring crowd, only to be brought back for a rousing encore. To say the crowd went away happy after a wild night of umbrella drinks and surf music, would be an understatement.